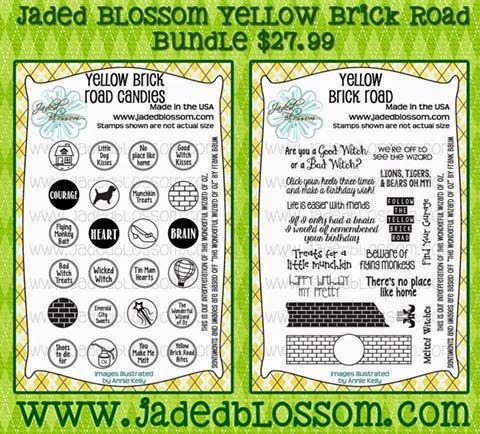 Jaded Blossom has 2 new awesome Stamp Sets they are offering today that we are using in our projects! I used the new Yellow Brick Road Stamp bundle with these new handle bags and cards from SVG Cutting Files. Below are the New Card Kits. 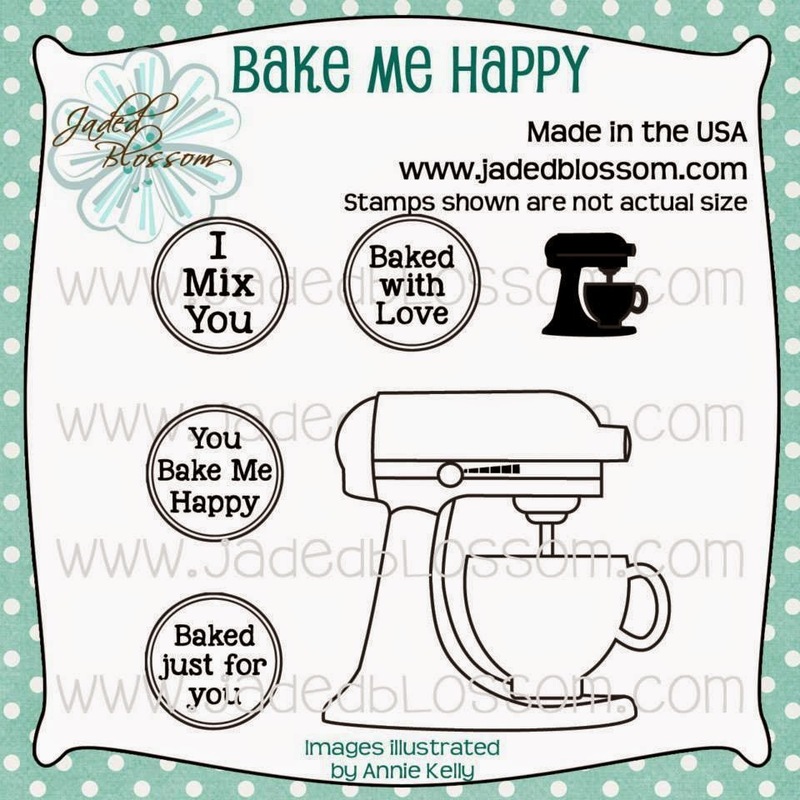 The sentiments are on Jaded Blossom's Flag Die and Mini Tag Dies 2. Hello! I am up on the Jaded Blossom Blog today and wanted to share some treats that I made for the kids this Thanksgiving. The Scallop Slider and Topper Die is used for the base of these treats. Jaded Blossom's 1 x 8 Clear Bags fit perfectly in the slider and I filled the bags with M&M candies. The pilgrim cuts are from Autumn Celebrations Cricut Cartridge. Their adorable faces are from my all time favorite Peachy Keen Stamps', Princess Faces. The Thanksgiving stamps are from the "Turkey Poop" stamp set. Hello Friends! I am posting over at My Digi World's Blog today. I have a cute card to share with you made with one of the ducks in the Old MacDonald set. He is colored with Spectrum Noir markers and I added a sentiment from Jaded Blossom. Hello Friends! 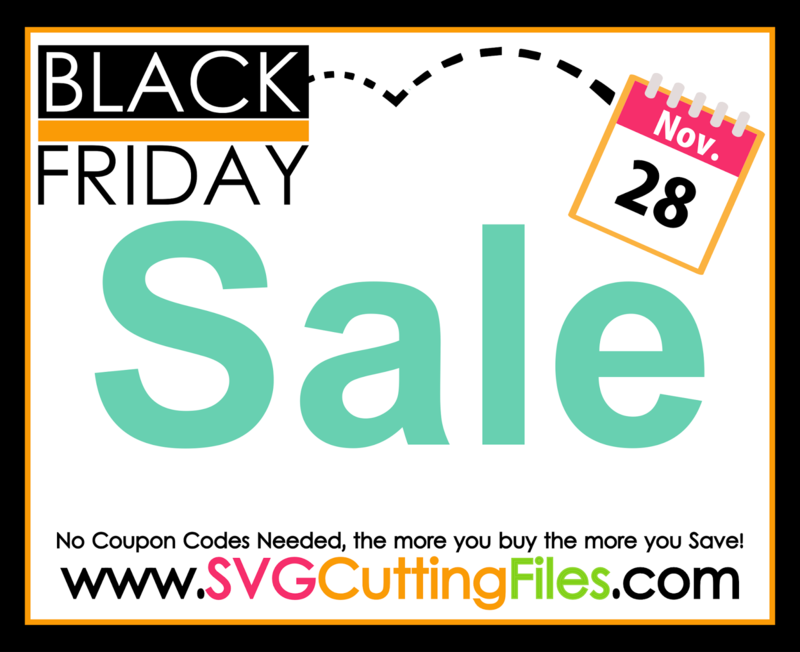 Today I am up at the SVG Cutting Files' Blog with a sneak peek of a file that will be at the store this Friday. Here is a new Squaredy Cat, "Not Squared to be Creative". I made this card with Jaded Blossom's Card Mat Dies and "Dream in Color" stamps. This makes a perfect card for a creative friend. Hello! Today is the start of a new challenge over at SVG Cutting Files. The theme is "All about Thanks". Head on over to the SVG Cutting Files' Challenge page to link up your project for a chance to win a gift certificate at the store. For my project, I used the giraffe handle bag. I added a sentiment from the "Go Wild" stamp set and placed the stamp on a Flag Die from Jaded Blossom. "Sugar Cookies" and "Cheesecake" stamps are from Desserts Galore. They fit perfectly on this die from Mini Tag Dies 2. "Keep Calm and Bake On" is from "Baked with Love" stamps. The cookie sheet is one of the New Baking Dies. One Lucky Winner will win this paper stack and ribbon! Just leave a comment on each blog for a chance to win. Good Morning! Today is Jaded Blossom's November Release Day! 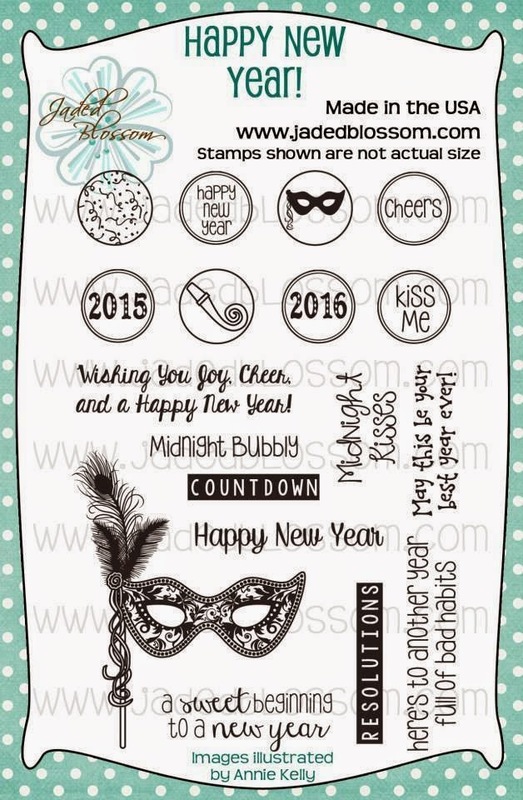 Today we have another stamp set, "Happy New Year" and the freebie stamp set, "Bake Me Happy". 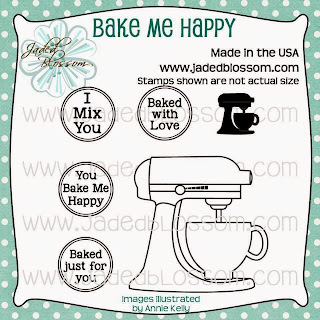 Here is what I made today with the freebie stamp, "Baked with Love"
I found this mixer shaped card at the Silhouette Design Store and decorated it with the NEW Baking dies. I used the circle die from the NEW Film dies and added an outer die shape with Jaded Blossom's Candy Charms and Banners. 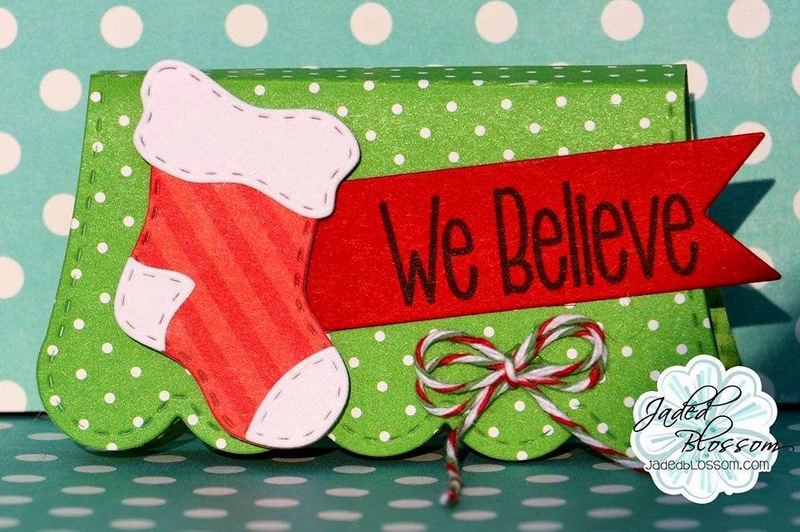 Visit Jaded Blossom's Blog to see what the rest of the designers have made today. 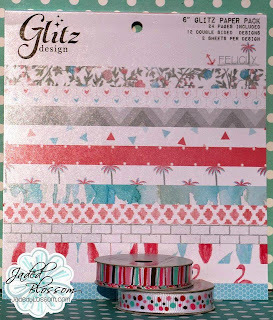 The treat topper is from Jaded Blossoms Scallop Slider & Topper Die. The sentiment is on one of the Mini Tag Dies 2. Good Morning! Welcome to day 3 of Jaded Blossom's November Sneak Peeks. Today the team is creating with "Lights, Camera, Action" stamps. These stamps go beautifully with the NEW Film Dies too. The sentiment fits perfectly into the clapboard die. The movie reel box is NEW from SVG Cutting Files today. 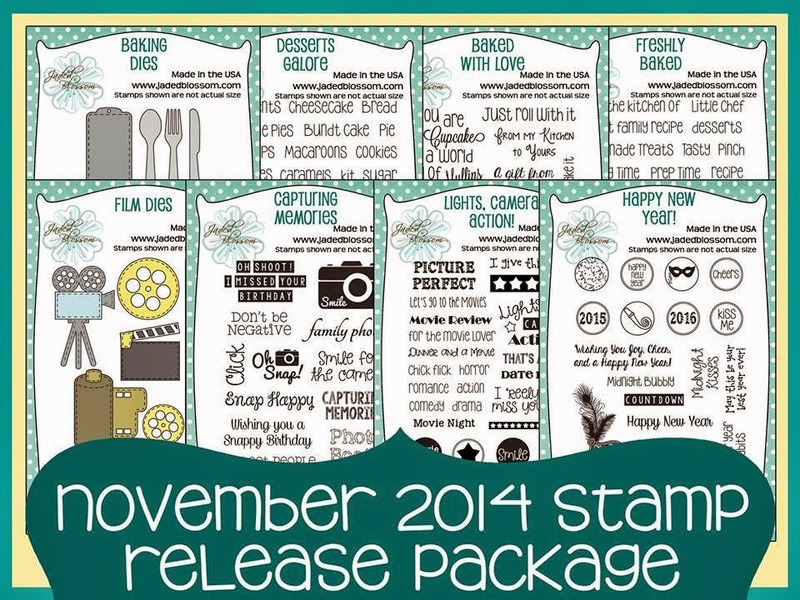 November 2014 Release will include: 6- 4 x 6 Stamp Sets 2 - New Sets of Die 1- 3x3 Freebie NO PREORDERS! NO BACKORDERS! No waiting WEEKS for your stamps. WE SHIP ASAP!!! This Package is only available till Wednesday 11:59pm pst, then will be back up on the store on Friday at 4pm pst during our Stamp Release Blog Hop! 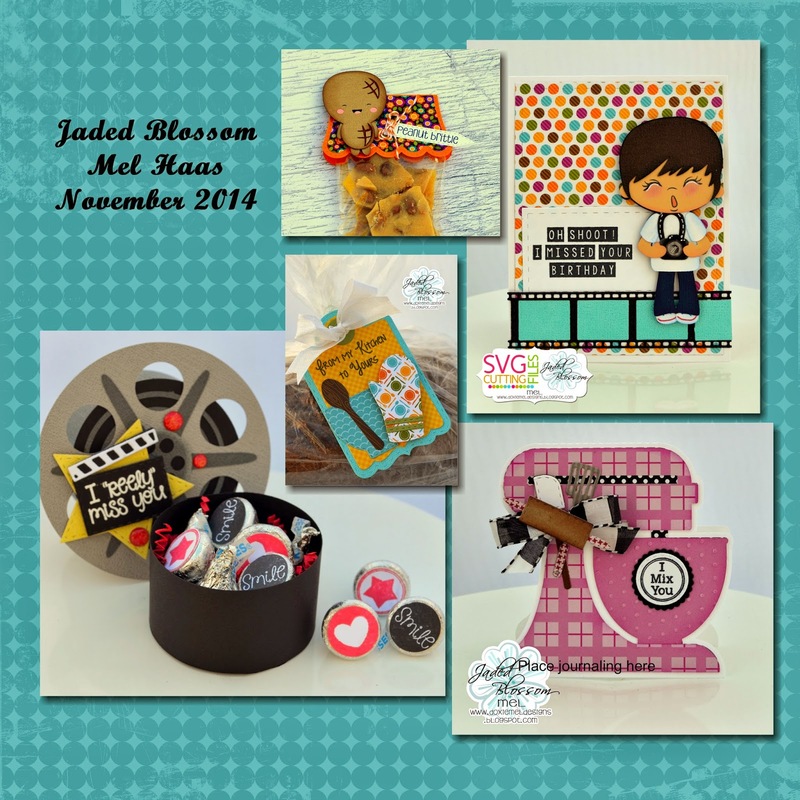 Visit Jaded Blossom today and see what the rest of the design team has made today! The NEW Kitchen Dies are so fun to create with! I used one of the spoon handles to add the green trim to the oven mitt. The kitchen dies are on the Jaded Blossom Treat Tag. 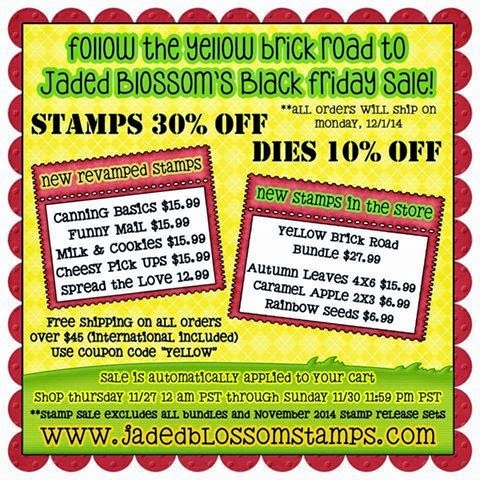 Welcome to Jaded Blossom's Stamp Release Day One! Today we are previewing a new stamp and die set. Here is what I made with the new stamps and Dies. The birthday cards have sentiments from Capturing Memories. The film strip is from the new die set, Film Dies. SVG Cutting Files made these adorable Chibi Camera Kids for this release. The boy and girl are available in each pose. Of course the beautiful face stamps are from Peachy Keen, PK-1411 Christmas in July Face Stamps. In case you get lost along the way, be thankful we have the complete line up for you below! Hello Everyone! Today is my post over at Digi My World. I am adding to my stash of cards with this sweet horse. The horse is from the Old MacDonald set, and he is colored with Spectrum Noir Markers. Hello! Time for another Challenge from Jaded Blossom. This month the theme is a "Thankful" theme. With Thanksgiving right around the corner, I made this shaped Turkey Card. The beautiful pattern paper is from Doodlebug Designs called Friendly Forrest. The mini clothes pin is from the Doodlebug Halloween Assortment. The turkey card is form the Silhouette Design Store, Turkey Shaped Card. I added a real feather to the top of his head and his eyes are flat back pearls.